We present the case of a 23-year-old white male, who presented to our hospital with complaints of pleuritic chest pain and exertional dyspnea of two weeks' duration. There was a history of trauma to the left leg, with swelling, two weeks prior. The patient's past history was significant for hepatitis C, substance abuse, and smoking. The patient was otherwise physically active and used to exercise for two hours daily. His vital signs were within normal limits and physical examination, including cardiovascular and respiratory system, failed to reveal any abnormality. An electrocardiogram (EKG) showed that the patient had poor r-wave progression and severe left axis deviation of minus 125 degrees. 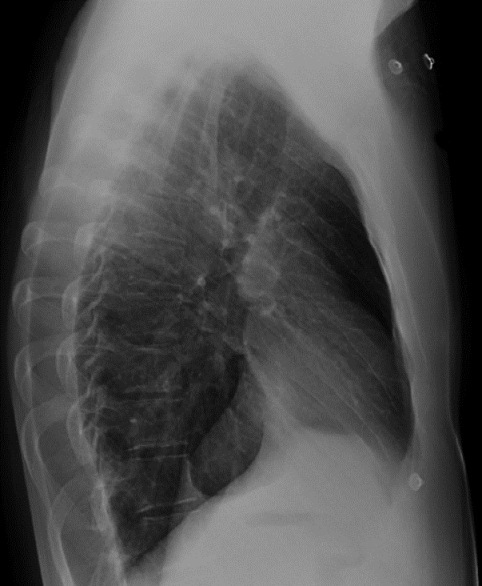 This would be typical of a heart that had rotated into the left chest, and a chest X-ray showed deviation of the cardiac silhouette to the left and clear lung fields. The Snoopy's sign was present [Figure 1]. The anterior clear space was prominent [Figure 2]. 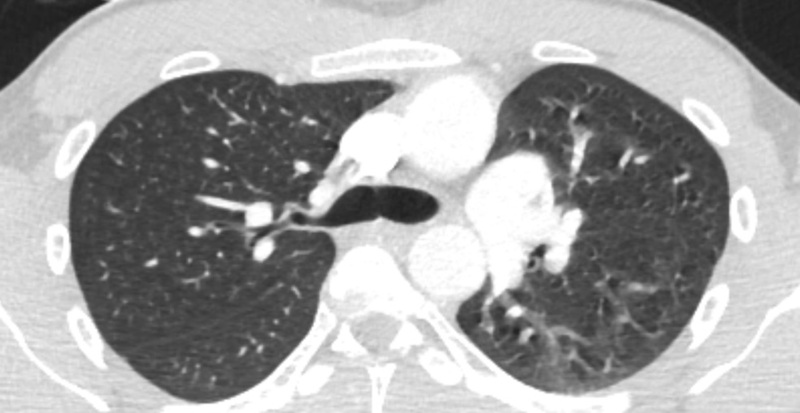 A chest CT with contrast and a pulmonary embolism (PE) protocol showed evidence of multiple emboli, predominantly in the left lung. The patient was started on heparin and warfarin therapy. Further history and workup for deep vein thrombosis (DVT) and a hereditary hypercoagulable state failed to identify a cause for PE. The patient was discharged, but later on readmitted to the hospital with chest pain and palpitations. Telemetry monitoring of the patient showed that the heart rate changes were from 30/minute to episodes where it went up to 112/minute. There was evidence of premature atrial contractions (PACs) and sinus arrythmias. 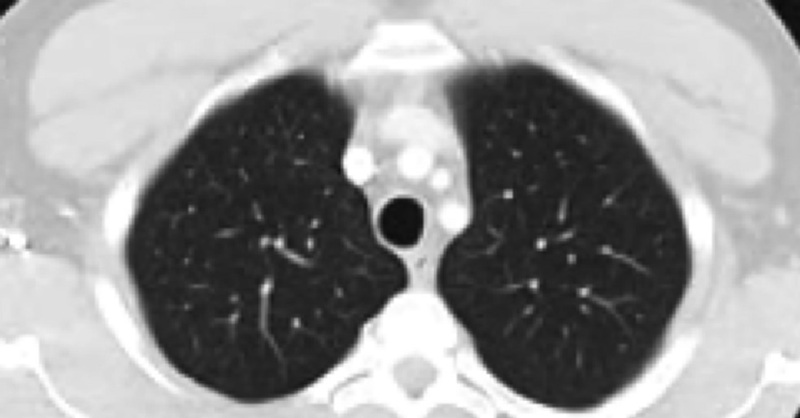 A repeat chest CT with contrast showed no significant change from the previous CT scan, showing the heart to be abnormally rotated to the left side of the chest [Figure 3] and [Figure 4]. The pericardium was absent. An echocardiogram confirmed the abnormal orientation of the heart, with the apex of the left ventricle sitting deeply in the left chest and a moderate amount of pulmonary hypertension [Figure 5]. A diagnosis of congenital absence of pericardium was made. 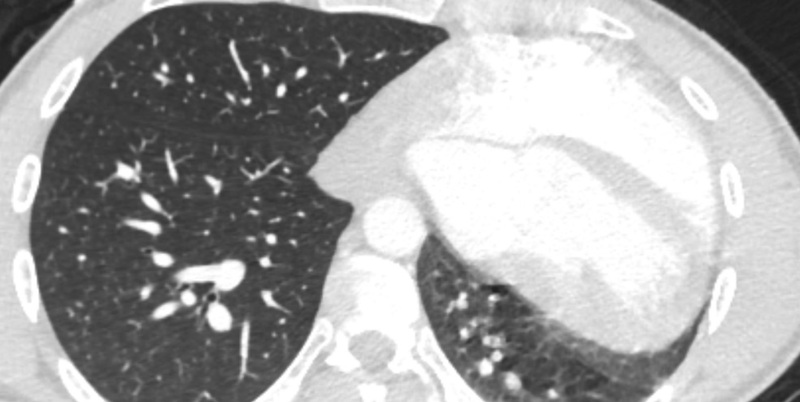 The misdiagnosis of pulmonary embolism was attributed to the motion artifact of the swinging heart ([Figure 6] showing abnormal CT scan compared with a normal chest CT; [Figure 7]). As the patient's symptoms did not prevent him from carrying out his daily activities, he was discharged with regular Outpatient follow-up. He was told to cease his daily regimen of an intense two-to-three hour workout. His symptoms usually came during this work out. Congenital absence of pericardium is a rare condition with most of the cases being asymptomatic. Patients who are symptomatic have rather non-specific complaints of chest pain, palpitations, dyspnea, and syncope. Diagnosis is suggested by the relevant findings on EKG, chest X-ray, and echocardiogram, and it can be confirmed by a CT scan or an MRI. Timely diagnosis can be complicated by the rarity of the disease and a physician or a radiologist may not come across even a single case in their life time. Motion artifacts are well-recognized pitfalls of a chest CT scan and can lead to a spurious diagnosis of pulmonary embolism. The most common is the respiratory motion, which obscures the diagnosis by decreasing the arterial opacification. Cardiac motion is usually less of a problem than respiratory motion and may result in a 'ghosting artifact' or 'seagulls' [Figure 6]. We have presented here a unique case of CAP, where the cardiac motion artifact led to a misdiagnosis of PE. The cardiac motion was exacerbated by the lack of pericardium support in our patient. In our patient the diagnosis of CAP was missed initially, despite the pertinent chest X-ray findings and the patient was treated for pulmonary embolism. This illustrates the importance of an increased awareness of the typical presentation and radiological features among physicians, so that a diagnosis is not missed. A CT pulmonary angiogram with cardiac gating will usually freeze the vessel motion and prevent misdiagnosis. 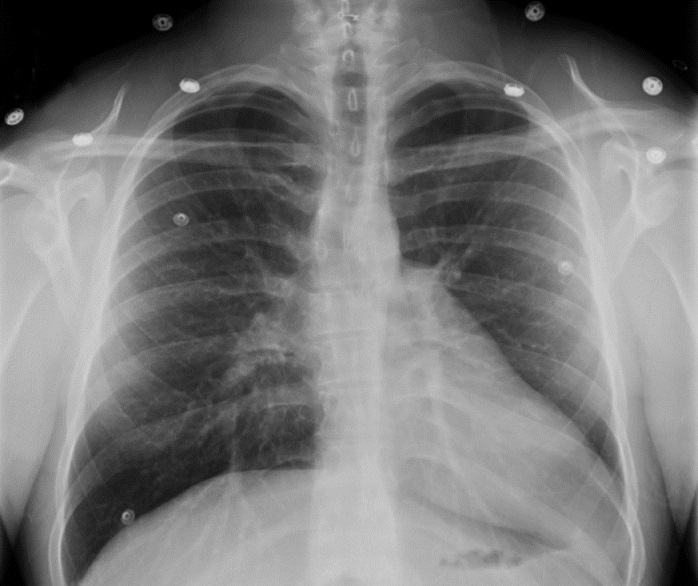 Congenital absence of pericardium should be included in the differential diagnosis of atypical chest pain and palpitations, and the physicians should be accurate in recognizing the specific radiological findings suggestive of CAP, so that early diagnosis is made. 1. Abbas AE, Appleton CP, Liu PT, Sweeney JP. Congenital absence of the pericardium: Case presentation and review of literature. Int J Cardiol 2005;98:21-5. 2. Yamano T, Sawada T, Sakamoto K, Nakamura T, Azuma A, Nakagawa M. Magnetic resonance imaging differentiated partial from complete absence of the left pericardium in a case of leftward displacement of the heart. Circ J 2004;68:385-8. 3. Garnier F, Eicher JC, Philip JL, Lalande A, Bieber H, Voute MF, et al. Congenital complete absence of the left pericardium: A rare cause of chest pain or pseudo-right heart overload. Clin Cardiol 2010;33:E52-7. 4. Chassaing S, Bensouda C, Bar O, Barbey C, Blanchard D. A case of partial congenital absence of pericardium revealed by MRI. Circ Cardiovasc Imaging 2010;3:632-4. 5. Gatzoulis MA, Munk MD, Merchant N, Van Arsdell GS, McCrindle BW, Webb GD. Isolated congenital absence of the pericardium: Clinical presentation, diagnosis and management. Ann Thorac Surg 2000;69:1209-15. 6. Ellis K, Leeds NE, Himmelstein A. Congenital deficiencies in the parietal pericardium: A review with 2 new cases including successful diagnosis by plain roentgenography. Am J Roentgenol Radium Ther Nucl Med 1959;82:125-32. 7. Nicolosi GL, Borgioni L, Alberti E, Burelli C, Maffesanti M, Marino P, et al. M-mode and two-dimensional echocardiography in congenital absence of the pericardium. Chest 1982;81:610-3. 8. Raman SV, Daniels CJ, Katz SE, Ryan JM, King MA. Congenital absence of the pericardium. Circulation 2001;104:1447-8. 9. Mantovani F, Barbieri A, Modena MG. Congenital complete absence of the pericardium: A multimodality imaging diagnostic approach. Echocardiography 2011;28:E21-2. 10. Wang ZJ, Reddy GP, Gotway MB, Yeh BM, Hetts SW, Higgins CB. CT and MR imaging of pericardial disease. Radiographics 2003;23:S167-80. 11. White CS. MR evaluation of the pericardium.Top Magn Reson Imaging 1995;7:258-66. 12. Ritchie CJ, Godwin JD, Crawford CR, Stanford W, Anno H, Kim Y. Minimum scan speeds for suppression of motion artifacts in CT. Radiology 1992;185:37-42. 13. Helical CT. Pulmonary Angiography for Acute Pulmonary Embolism: Pitfalls in the HCTPA Diagnosis of Acute PE. Available from: http://www.medscape.com/viewarticle/433087_4.